If you missed our Science Fiction Sextuple Feature this past Tuesday night, you missed a brisk, funny, and exciting evening with some of today's upcoming and best writers of speculative fiction. That's right, we were joined upstairs at Hopleaf by the members of the Wellspring Workshop, who took a break from an intense week of critiquing novels to read for us and our excellent audience. Kelly Swails kicked things off with a tantalizing excerpt from her time-travel story "A Portrait in Time." Gregory A. Wilson thrilled us with the creatures in his novel-in-progress Icarus (featured in the video below). Vincent Jorgensen showed us a near future dominated by internet search giant Pood!e. And Holly McDowell moved us with an excerpt from her novel-in-progress, Farah Minor. After a break to let our audience visit John at the bar, co-host William Shunn read his poem "The Lunar Night, Chicago." Sarah K. Castle brought us terrifyingly face-to-face with "The Mutant Stag at Horn Creek." And Brenda Cooperafter giving away a copy of Year's Best SF 16 to one of the non-SF readers in our audienceshowed us what happens when a young girl in a post-apocalypse Pacific Northwest no longer wants to remain "In Their Garden." In short, it was the kind of quality evening you've come to expect from Tuesday Funk. We're taking the month of July off, but please join us next on August 2nd for an evening with Tegan Jones, Sondra Morin, Eden M. Robins, Julie Rosenthal, Jerry Schwartz and Karen Skalitzky. You won't want to miss it! Reminder: Tuesday Funk #35 is tonight! Happy Summer Solstice, in honor of which your friends here at the Funk are staging an alien invasion tonight in Chicago! Well, at any rate, a group of fantastic out-of-town writers from around the country will be converging on Hopleaf for a phantasmagorical edition of Tuesday Funk. That's the monthly Chicago reading series where good writing and good beer mix, and where this evening we're celebrating our 35th stellar episode with a very special Science Fiction Sextuple Feature. Our amazing guestson loan from the Wellspring Workshop in Lake Geneva, WIwill include Brenda Cooper, Sarah K. Castle, Holly McDowell, Gregory A. Wilson, Vincent Jorgensen, and Kelly Swails. We'll also throw in one of our patented Poems By Bill for no extra charge. Hey, the show's free anyway, so it's no skin off our proboscides! We hope you'll avail yourself of a beer or three at the barbut only if you're not piloting a car or a spaceship home afterward. So let your geek flag fly, set your phasers on fun, and join us tonight for six terrific journeys to the ends of space and time! Oh, one more thing, and please pay attention! Show up at Tuesday Funk tonight to learn how you can attend a very exclusive advance screening of ATTACK THE BLOCK, the latest movie from the producers of Shaun of the Dead and Hot Fuzz, taking place in Chicago on Thursday, June 23. You won't want to miss this story of a London street gang defending their council estate from alien invaders. So be there at Hopleaf, or "like" us today on Facebook, and we'll get you the skinny on this acclaimed U.K. flick. See you tonight! Please join us on Tuesday, June 21st, upstairs at Hopleaf at 7:30 pm, for more great tales of fantasy and science fiction by Brenda Cooper, Sarah K. Castle, Holly McDowell, Gregory A. Wilson, Vincent Jorgensen, and Kelly Swails! It's Tuesday! And It's free! Our upcoming special edition of Tuesday Funk, the "Science Fiction Sextuple Feature," features six attendees of the inaugural Wellspring Workshop, an intensive workshop for speculative fiction novelists taking place in Lake Geneva over the course of the next week. And Wellspring would not have been possible without the hard work and commitment of organizer Bradley P. Beaulieu. Brenda Cooper is a Seattle-area futurist and writer, and also the CIO for the City of Kirkland. 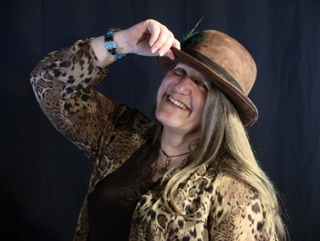 Brenda writes a monthly column for Futurismic called "Today's Tomorrows," and is the author of the Endeavor award-winner for 2008, The Silver Ship and the Sea, and of its sequels Reading the Wind and Wings of Creation. She co-authored Building Harlequin's Moon with science fiction legend Larry Niven. Her next book is Mayan December, coming from Prime Books in August 2011. Visit her website at www.brenda-cooper.com. 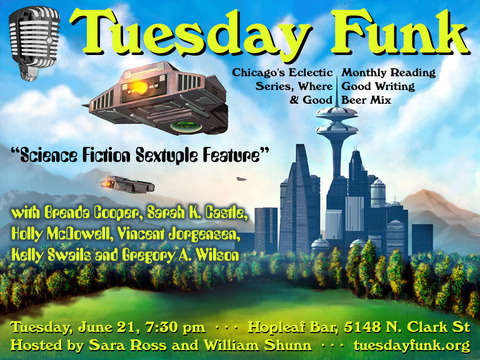 Join Tuesday Funk's special Science Fiction Sextuple Feature on June 21, 7:30 p.m., at Hopleaf's upstairs bar to hear Brenda and the rest of our talented readers! 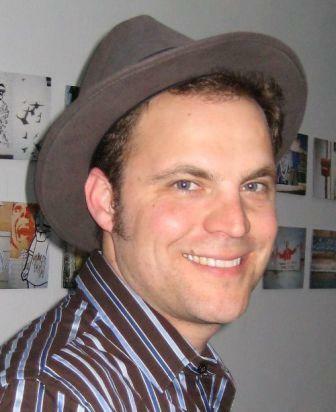 Vincent Jorgensen is a writer-engineer living in the epicenter of the Silicon Valley. He has been a stay-at-home dad, a microchip designer, and a science-fiction class instructor at UC Berkeley. Vincent loves languages and can speak French and Spanish, as well as read Latin and Greek. He loves to travel, and once penned a short story during a hurricane in México. 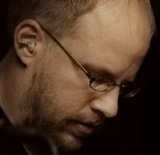 He attended the Clarion Science Fiction and Fantasy Writers Workshop in 2006. Join our special Tuesday Funk Science Fiction Sextuple Feature on June 21, 7:30 p.m., at Hopleaf's upstairs bar, to hear Vincent and all of our amazing readers! Holly McDowell lives and writes in Boulder, Colorado, with her rock-climbing husband and the world's cutest Polish Lowland Sheepdog. This picture was taken during her recent visit to Chicago, when she fell in love with the city. Join Tuesday Funk's special Science Fiction Sextuple Feature on June 21, 7:30 p.m., at Hopleaf's upstairs bar to hear Holly and the rest of our talented readers! Kelly Swails is a clinical microbiologist by day and a writer by night. When she's not wrestling with bacteria or words, she can be found reading, knitting, or watching movies. 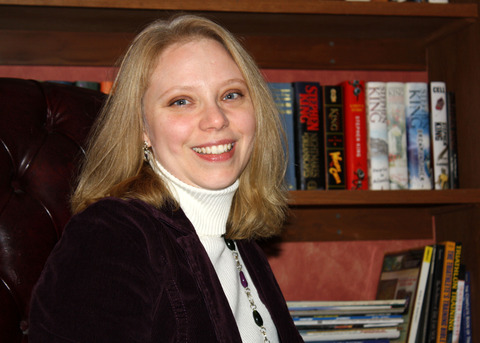 Her work has appeared in several anthologies, including *Timeshares* and *The Crimson Pact,* and she is currently working on a novel. Find her online at www.kellyswails.com. Join Tuesday Funk's special Science Fiction Sextuple Feature on June 21, 7:30 p.m, at Hopleaf's upstairs bar to hear Kelly and the rest of our talented readers! Gregory A. Wilson is currently an Associate Professor of English at St. John's University in New York City, where he teaches creative writing and fantasy fiction along with various other courses in literature. His first academic book was published by Clemson University Press in 2007; on the creative side, he has won an award for a national playwriting contest, and his first novel, a work of fantasy entitled The Third Sign, was published by Gale Cengage in the summer of 2009. He regularly reads from his work at conferences across the country and is a member of Codex, the Writers' Symposium, Backspace, and several other author groups on and offline. He is currently in the process of submitting his second and third novels, Icarus and Grayshade respectively, to publishers, represented in this effort by Roger Williams of the Publish or Perish Literary Agency. With fellow speculative fiction author Brad Beaulieu, he co-hosts Speculate! : The Podcast for Writers, Readers and Fans. He lives with his wife Clea, daughter Senavenenamed at his wife's urging for a character in The Third Sign, for which he hopes his daughter will forgive himand dog Lilo in Riverdale, NY. Join our special Tuesday Funk Science Fiction Sextuple Feature on June 21, 7:30 p.m., at Hopleaf's upstairs bar to hear Greg and all of our amazing readers! Sarah K. Castle published her first essay in Rider Magazine in 1987. Almost twenty years later, she got busy writing science fiction. 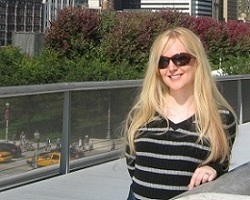 She attended Clarion Science Fiction and Fantasy Writers' Workshop in 2006. Since then, she's published stories in Analog Science Fiction and Fact and Nature. Sarah lives in Flagstaff, Arizona. 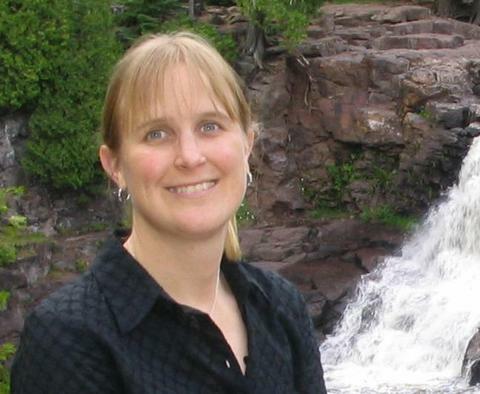 She's a registered geologist and has worked in national forests, oil fields, a landfill, and most recently for the Institute for Tribal Environmental Professionals. For more information, visit Sarah's site at http://www.skcastle.com, or follow her on Twitter at http://twitter.com/castlesarah. Join us at our special Science Fiction Sextuple Feature on June 21, 7:30 p.m., to hear Sarah and the rest of our out-of-this-world readers!